Plaza Fleet Parts uses the Meritor Driveline Remanufacture System (DRS) for precise balancing of drive shafts. This consists of three machines which can disassemble and rebuild your driveline to original specifications then dynamically balance it to operating speeds up to 3,600 rpm. We are especially proud to have technicians who have been working with this equipment and become highly skilled over several years. An hydraulic cut-pull-push yoke press greatly reduces the time required to reconfigure drive shaft components. A welder/straightener allows for variable speed rotation of the driveshaft to insure that welds are stronger and more precisely aligned. But it is the Rockwell (now Meritor) driveline balancer that measures the digital angle and amount of imbalance that enables us to set high standards for the performance of your driveline. When you can take advantage of this level of expertise, why settle for a service shop that does not have a high speed driveshaft balancer? Step 1 is to insert an existing driveline or the components of a new driveline into the yoke press. 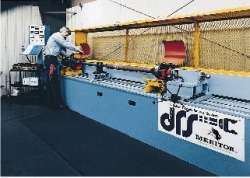 This single machine provides the fixturing and leverage to assemble components as efficiently as possible. Step 2 is to mount the driveshaft on this equipment which measures how closely the components can revolve around the main axis. The components are welded together when the calipers indicate a fit within a few thousands of an inch. After this the drive shaft is ready to be rotated at a high rpm and balanced.